Misericordia makes transitioning into a new college as stress-free as possible to make it easier for you to call us “home”. Get the fresh start that you have been looking for at an institution that truly understands your needs. 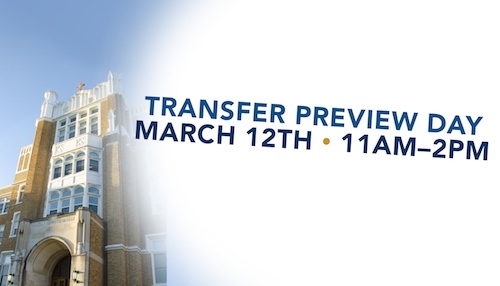 Come explore MU at our Transfer Preview Day for full time traditional transfer students! Get unofficial credit evaluations and meet with a variety of people on campus: admissions, financial aid, residence life, career development, faculty and students. More than 20 majors will be included and lunch will be provided. Interested students will also have the option to tour our beautiful campus and sit-in on a class at the end of the event. We know that each transfer student is coming from a unique background and experience; as such, we provide a support system to ensure that the transition is seamless. We work closely with each student to understand all individual needs and personal goals. Moreover, we work hard to bridge the gap for each student so that transfer students can pick-up where they left-off without missing a beat. Four out of five Misericordia students participate in an internship, fieldwork, or a clinical experience before they graduate. Many students will do several. 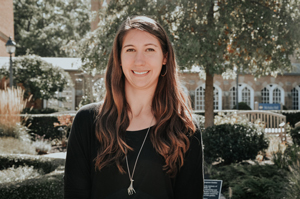 A specialized counselor who works exclusively with transfer students will assist with everything from the application and admissions process to the financial aid and course registration process, answering any questions and keeping students informed along the way. This individual will also offer expert guidance on the various program options and acceptance criteria, and provide an informal evaluation of transcripts. Quite simply, it is our objective to give each student a positive experience and the opportunity for success. Contact Christine Marks, Assistant Director of Transfer Admissions, at 570-674-6462 or cmarks@misericordia.edu to learn more about transferring into Misericordia University. Schedule a personal visit to meet with the Transfer Counselor by clicking here. Transfer students are also encouraged to get involved and to experience Misericordia in a similar way as traditional students - to feel the same sense of belonging and pride. Misericordia welcomes the men and women who have served or are currently serving our country in the U.S. Armed Forces, including spouses and dependents.Click here for information about Misericordia's Veteran Services including the Yellow Ribbon program. In certain circumstances, students may apply as undeclared. Whether you are transferring as a resident student or a commuter student, Misericordia affords many opportunities to get involved and enjoy your campus experience. 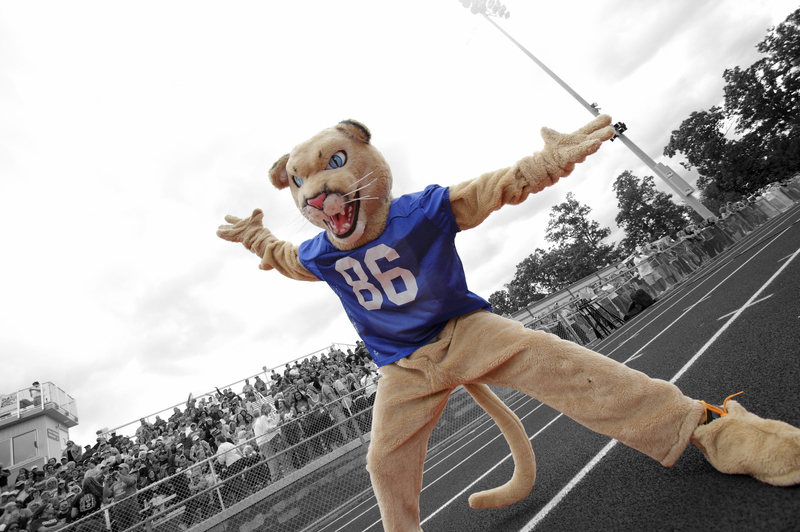 From the numerous student clubs and organizations, to our abundant sports and recreational activities, if you are looking for a college with the right balance of academics and entertainment, Misericordia University is the right campus for you. We have countless areas throughout our campus where students like to hangout and relax, along with basketball courts, soccer fields, and other facilities where students partake in recreational games. If you are more of an observer, come watch one of our Division III or intramural athletic teams compete on campus. Click here for more details about our athletics programs. Not a big fan of sports? Not a problem. Come visit our art gallery, attend a musical performance, participate in a stand-up comedy act, go rock climbing, and much more. Check out the many students activities options available by clicking here. You can even catch a campus shuttle to go to a favorite restaurant or shop. If you are an individual who enjoys helping others and making a difference, Misericordia also provides service opportunities both locally and internationally. Depending on how far you want to venture off campus, Misericordia offers a Study Abroad/Away program to enhance your educational experience while gaining an appreciation for different cultures. There is always something happening in and around our campus. You will notice how friendly and welcoming everyone really is here, while at the same time, create lifelong memories and new friendships. Check out the latest issue of Misericordia Today to learn more about what is happening on campus as well as what our students & graduates are achieving. Commuting students are encouraged to utilize all university services and to get involved in clubs and organizations and to participate in social and co-curricular activities. You will find that commuters have a strong voice on campus even though they are not residential students. The Commuter Council is an organization that represents commuter student issues and provides social opportunities on campus. The council meets regularly and meetings are advertised through the Misericordia portal, MyMU. Commuters are also represented on the executive board of the Student Government Association. The commuter representative of SGA attends commuter council meetings and works with SGA to address commuter concerns. There are several lounges for students to sit and relax or study in between classes. Vending machines can be found in lounges located in Mercy Hall and the Banks Student Life Center. 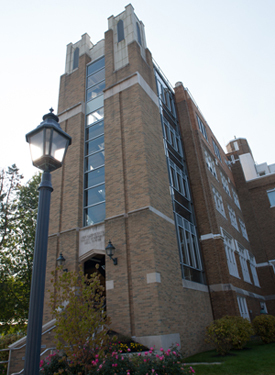 Comfortable seating and a small kitchen can be found in the Henry Student Lounge, located in the small building in front of McGowan and Alumnae Halls. Commuter meal plans are available through the Student Financial Services office. Flex dollars (cash debit system on the student ID) can be added or special meal plans for commuters only can be purchased. Flex dollars can be used in the Dining Hall and in the Cougar's Den. Meal plans are used in the Dining Hall for all meals. It is important to know that all commuters must purchase a parking permit through Campus Safety.